The crystallized ginger on top of these cupcakes was a last minute addition. 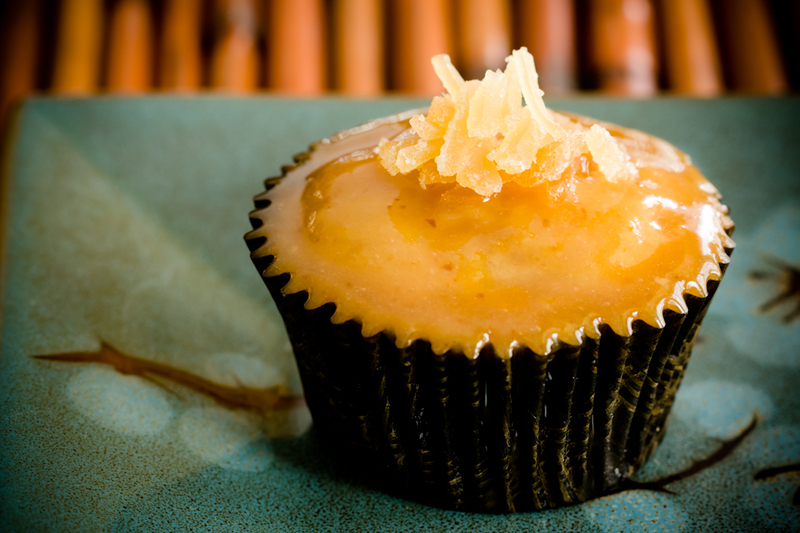 However, it rounded out the flavor of these ginger pear cupcakes with miso caramel glaze so well that I’m listing it as a required ingredient – not an optional topping. 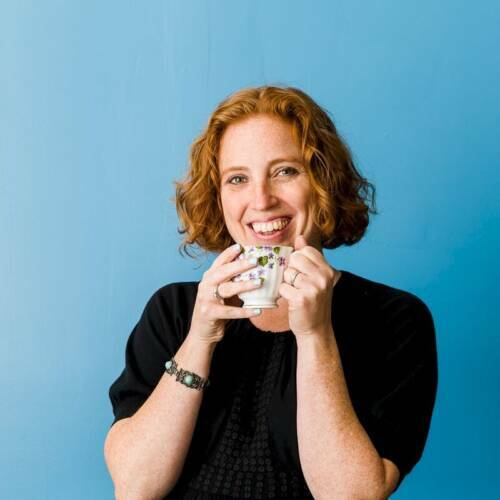 My food stylist/photographer husband put the candied ginger in a little nest for aesthetics, but I’d recommend spreading it out so that you get a little piece of it in each bite for the optimal eating experience. 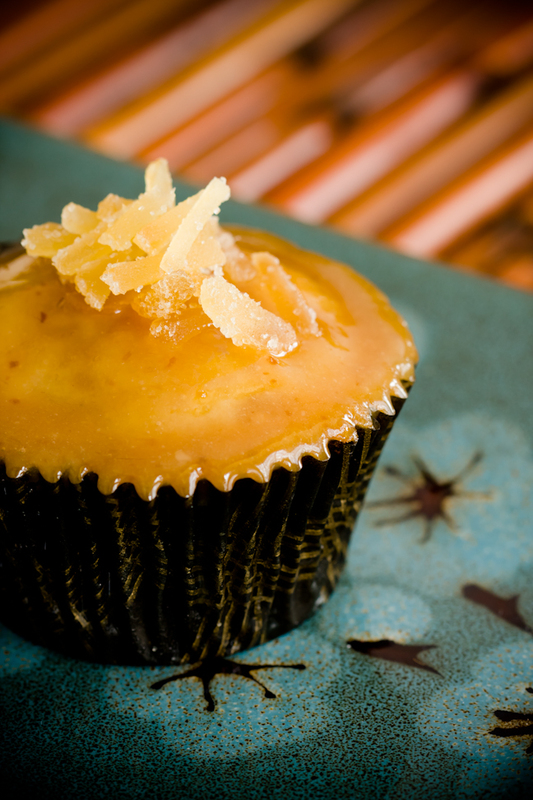 That way, each mouthful will fill you with buttery yellow cake, fragrant and juicy pear, oozey sweet and salty caramel, and sharp, spicy ginger – cupcake nirvana. To make the ginger pear cupcakes, add ground ginger and chopped pears to your favorite yellow cake recipe. I started with a pound cake cupcake recipe which produces really dense cupcakes. If you like lighter/fluffier yellow cake, try my sour cream cupcake recipe instead. as someone who LOVES ginger in all of its forms – crystallized, fresh, ground – these look yummy.. I made these this afternoon and they are fabulous! My sons (7 and 2) both loved them and even snuck back into the kitchen to grab seconds before the cupcakes even finished cooling! I made the miso salted caramel, too. It wasn’t as sweet as I had been expecting, but didn’t stop me from eating it! It was my first time making caramel and I think I may have pulled it from the heat a little too early. Thanks so much for two great recipes – we will definitely be making these again soon! Mmmm! That looks so yummy! These treats are absolutely delish. Will you help me spread the word? Oh Lordy….I can practically taste it! so disgustingly good! They look so delicious. I love cupcakes and love caramel so these seem like a winning combination. Stunning photos too, really add to the post. I made these today for Chinese New Year! I used your sour cream cupcake recipe. It was so much fun – and yummy too! I was so excited about the miso caramel… while being so nervous about the addition of sour cream. It was wonderful though. Thank you so much for a great recipe! I love the sweetness with a little bit of fiery in it. This is good for the winter cold. Thanks so much for the recipe. Gosh. This looks so tempting. My kids will surely love this cupcake. I can’t wait to see their faces when they see this on the table. Thanks for the recipe. If you only have “can” pears..would that work? MrsCLS – Yes, canned pears will be fine. The recipe doesn’t list baking soda or powder as an ingredient. Is this correct? Yes… it’s a dense cake so it doesn’t need it.